CHO loading can overcome lower resting muscle glycogen in the follicular phase but an increase in total energy intake may be required. Pre-exercise feeding and/or CHO ingestion can negate effects of the oestrogen-induced reduction in gluconeogenesis during endurance exercise. Increased protein during recovery may help offset the increase in protein catabolism in the luteal phase. Special attention to not overhydrate and replace sodium losses in the luteal phase of the menstrual cycle may help reduce the increased risk of hyponatraemia that is due to differences in fluid and electrolyte handing and thirst in this phase. Supplementing with dietary sources of antioxidants may be prudent in those with amenorrhoea or in menopause and, thus, low oestrogen, as oestrogen enhances antioxidant capacity. However, this may not fully compensate for lack of oestrogen. Fish oil (omega-3 fatty acid source) may aid in inflammatory disorders such as dysmenorrhoea and those associated with menopause. Vitamin D and calcium influence fertility, possibly dysmenorrhoea, as well as bone health; however, supplementation cannot fully compensate for lack of oestrogen. 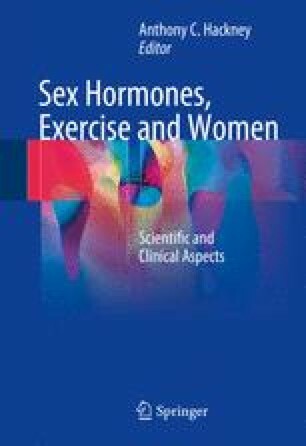 Branched chain amino acid oxidation may be greater when oestrogen is low; this may have dietary implications for those with amenorrhoea or in menopause, particularly when training regularly and or on low energy diets. The authors would like to thank Dr James D. Cotter for his insightful suggestions.